Just walk in and get the care you need. From insurance to ID, everything you’ll need for your visit. The services you need to keep your employees healthy. Start building a career you love. The MedExpress Blog − Health. Wellness. Careers. 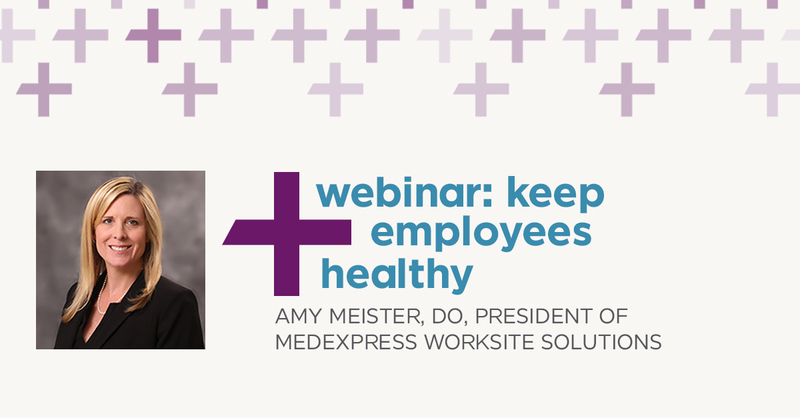 Amy Meister, DO, president of worksite solutions, is responsible for MedExpress centers located in places of employment. MedExpress worksites provide direct care to employees while they are at work. Dr. Meister has practiced medicine for 17 years, with a focus on acute and chronic condition management. She handles a full spectrum of diseases and transitions of care to ensure the right care, at the right place, at the right time. We offer flu shots for you and your family, as well as flu shot on-sites for your worksite. At MedExpress, we are proud to provide the services and screenings that your employer requires. Your MedExpress neighborhood medical center may be closer than you think. Unfortunately, there are no MedExpress centers in this area. Please search for a new location. Please zoom in closer or click on a pin to view information about a specific MedExpress center. Please search by city/state or zip to find a MedExpress center near you. ^In Delaware, MedExpress is referred to as MedExpress Walk-In Care. Urgent Care MSO, LLC (“MSO”) is a management services provider for physician-owned and other urgent care, walk-in, and on-site centers operated in multiple states as “MedExpress” (hereinafter “Private Office Practice”). The Private Office Practice has complete authority with regards to all medical decision-making and patient care. MSO shall, in no way, determine or set the methods, standards, or conduct of the practice of medicine or healthcare provided at, or by, or through any Private Office Practice, or by any of its professionals. MSO provides consultation services and offers recommendations through its Chief Medical Officer for the Private Office Practice to consider, reject, revise, and/or adopt as it deems fit. This information is not intended to replace the advice of a physician. It is information that is generally available. Each person has unique medical needs based on several factors including age, genetics, body type and build, medications, exposures to illness and medical history, to name a few. Always seek the advice of a physician or other qualified healthcare provider with any questions you may have regarding a medical condition that you are experiencing. If you are suffering from a non-emergent medical situation, it is suggested that you visit the nearest MedExpress center or your family physician. If you believe you are experiencing a medical emergency, call 911.